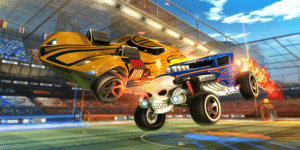 Rocket League Will Soon Feature Hot Wheels | Nerd Much? It’s a dream come true for some folk, to finally have their childhood favorite toys in a video game. Though all I see is product placement and an excuse to sell more toys based on the game for kids. But if you love this game, you can finally look forward to Hot Wheels being a part of the roster. Will you be picking up your favorite Hot Wheels? Let us know in the comments below!